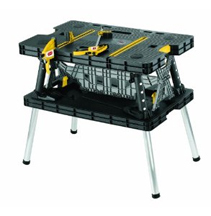 Keter adjustable leg-folding work table: image via keter.comThere are plenty of us around; 'garage' inventors, we are called. Inventing isn't usually our day job and we may not actually invent or create things in our garages, but prototypes of our ideas abound, and we generally make and store them somewhere in our homes, if we're not lucky enough to have an actual garage. Keter Plastic Ltd., an international manufacturer and marketer of resin-based household and garden products, has teamed up with Edison Nation to entice you to submit your brilliant solutions for hardware storage in your garage (or other storeroom) to its competition. 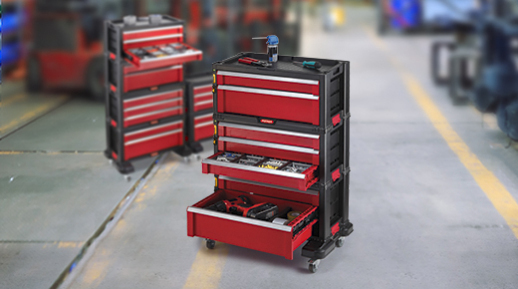 The 7-drawer tool station, above, is deceptively innovative; take a look at its web page, and you will see how unique it is. 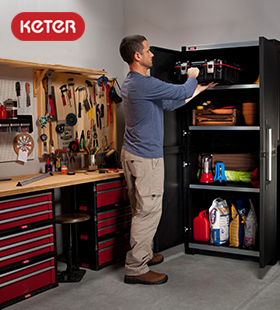 It's the kind of innovation Keter is searching for: something truly original that makes total sense to the consumer who needs to organize his or her stuff in a workspace - be it a garage, a utility room, or a basement. Make sure you read Edison Nation's licensing policies and practices before submitting any ideas.